In the words of that immortal beauty sage, Truvy Jones: Honey, time marches on and eventually you realize it is marchin’ across your face. Sisters, that day is here. I am not going to fight aging. But neither am I willing to sit idly by. I have amazing genes on both sides of my family. My mother and my aunt look nowhere near their ages. Good stuff. But the good stuff could always use a hand up. My problem is, have you looked at anti-aging stuff lately? No Bueno. As if skin care conglomerates believe women are willing to take the risk of dangerous chemicals and toxins to look younger for a few more years. One of the biggest mom job make-up companies—Mary Kay Cosmetics—refuses to disclose their skin care regimen ingredients, despite pressure from several watchdog groups. I attended a “party” with one of the top sellers in our region in the last few months and she gleefully explained that the make-up remover will not just remove make-up from your face, but crayon from the wall and red wine from the carpet! My face stopped her cold. “Why on earth would I put that on MY FACE???! !” I asked. Here’s my line of thinking—if the make-up is so petroleum based that I need an industrial strength cleaner to get it off my living, breathing skin—then I’m O. U. T.
If you don’t know Skin Deep, it’s worth a visit. I have the app on my phone, which allows me to scan bar codes of products and instantly see whether they are safe based on cancer, allergy, and developmental and reproductive concerns. This is how I know that most of the anti-aging products available in stores (from Walgreen’s to Nordy’s) are not safe. You know already what Dana and I did. We made some ourselves. I got Natural Beauty ($15.95 new) on Amazon. I ordered all the oils from Amazon, as well, using my Prime membership for faster shipping. And they have the 2 oz glass bottles ($21.99 for six). I did not buy the dropper tops because I thought that would be messy. I bought the pump tops and they work great. Add all oils to bowl. Mix well. Transfer to bottle ($2.66 each). Apply over a clean face morning and evening. Follow with sunscreen in the morning and anti-aging face butter at night. Holly Berry Dairy is one of our local goat milk soap and lotion makers. 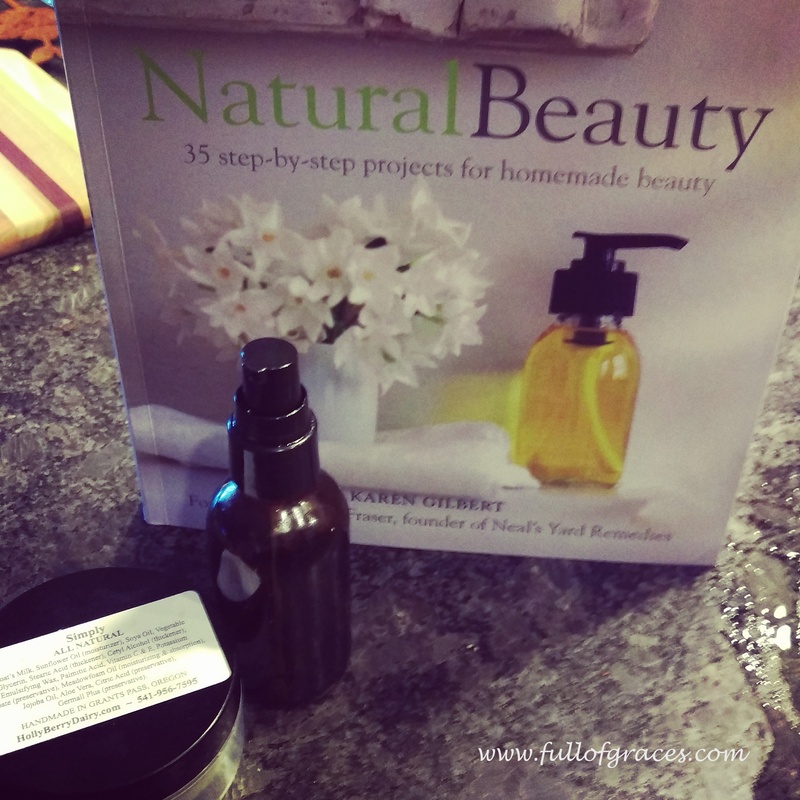 She just started making fabulous unscented body butter, which is not yet available on her website, but for this recipe any natural and unscented lotion or body butter will work. The folks over at Goat Milk Stuff also make an unscented tub of lotion. Mix thoroughly. Apply morning (follow with a sunscreen) and evening over Regenerating Skin Serum. Some of these oils are the most expensive essential oils on the market, with a combined cost of $254.50 as purchased from DoTerra. But a .5 oz vial has 228 drops. So a $75 vial of helichrysum can make 38 batches of anti-aging cream. Yes, the initial overall investment is a big gulp–$336.92. But I made my first batch in May and am only half way through. So if each batch lasts four or five months, we are looking at a cost of $70/year for a natural, safe and effective anti-aging regime. Come on, ladies. We’re worth it! *I can, however, highly recommend Arbonne’s baby sunscreen and their mascara, which both scored a 1 on the Skin Deep scale and work wonderfully.